Do you have a favourite view of the Mornington peninsula? Would you like to have that as a landscape print on your wall? Peter does and he did. Here a quick photo of peter taking delivery of his landscape print. The print was the culmination of 3 visits to Peters place. First we had a meeting to talk about the type of photograph that peter wanted and where he wanted to hang the finished print. 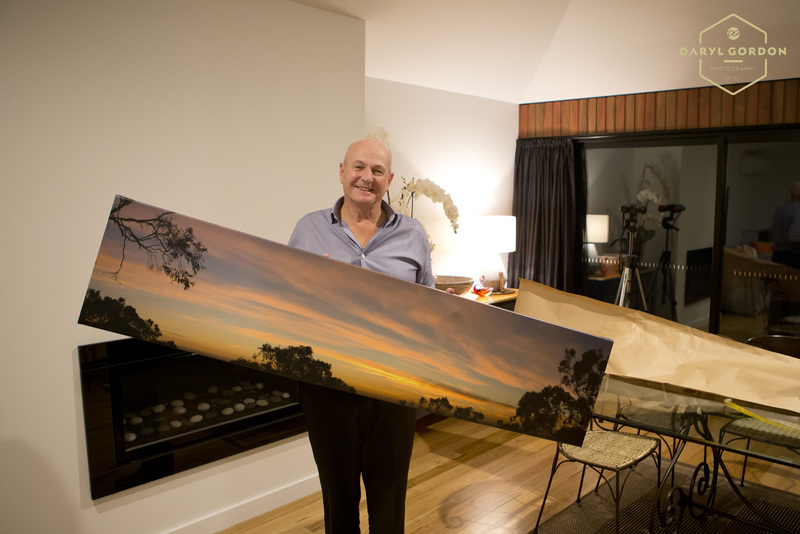 He was wanting to capture the spectacular sunset that he sees from his balcony, I suggested we shoot a panorama, that is a combination of a lot of photographs stitched together this would provide the shape of the print and the detail in the photograph that he was looking for. The next two visits were shooting the sunset the first effort didn’t turn out as the finicky sun failed to pop out from behind the cloud. On the third vista we were more successful. We stitched together over 10 images to produce the final print. This print was produced on cotton canvas. Our canvas prints come with a 75yr unconditional warrantee against fading,colour shifting and accidental damage. This print is a limited edition one of a kind print it will never be reproduced for anyone.